Breaking up is hard to do. Getting over it doesn’t have to be. 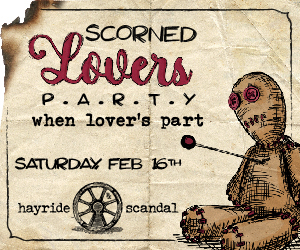 On Saturday, the 16th, join Hayride for their SCORNED LOVERS Party, a getting-even party, filled with tarot cards, Voodoo dolls and special cocktails dedicated to love on the rocks. You want cathartic? Fill out a personalized curse or bring pics of your old flame and thrown ‘em in the fire. For mending a broken heart, it’s an ex parte you won’t want to miss.